It is now only a week or so away from the Revelation User Group Meeting in London. I’d like to take this opportunity to remind those of you in Europe that have not registered, that this is the main Revelation UK event that enables OpenInsight developers and users to find out about where Revelation are now, their plans for the future and also, on this occasion, all about where we are with the forthcoming OpenInsight 10. The final agenda is being put to bed over the next few days. Unlike previous years, we are trying to hit a moving target and incorporate as much of what we can physically show as possible with regards to OpenInsight 10. Please watch the blog for information as it is finalised. We will meet at the Hilton Doubletree in Ealing London from 9.30am. There will be some refreshments available and we plan to start the formal presentations at 10.00am. The morning sessions will be punctuated by one break, leading to lunch and then another break mid-afternoon. Lunch will be served in the hotel’s restaurant. We aim to complete the formal sessions at about 4.30pm and we will need to have vacated the meeting room no later than 5.00pm. I hope that the sessions will cover; The state of the company, The OpenInsight 10 project, Connectivity (Couchbase, etc.) and maybe one or two other things. The map above shows the location of the two best underground stations for the venue. 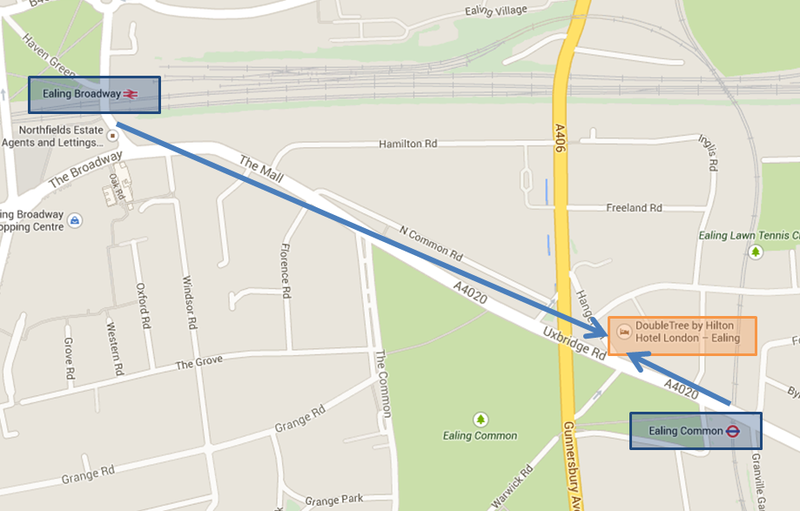 The hotel is marked in the orange box and the two underground stations in the blue boxes. The Hilton does have parking on site but it can be limited and there is a charge. Please check with the hotel direct for future details. 2-8 Hanger Lane, Ealing, W5 3HN. Stop Press – RUG & O4W training Days. Following the highly successful conference in Las Vegas last week, RevSoftUK are planning to hold a Revelation User Group meeting on 8th November 2011 somewhere in central London. Whilst the timings and venue are yet to be confirmed, the agenda will be given over largely to Mike Ruane during which he will explore the new features contained in OpenInsight 9.3 and O4W, talk about the state of the company and plans for both OpenInsight and O4W in the future. Consideration is also being given to holding a mini O4W training session on Wednesday, the day after the RUG meeting. The venue will likely be the same, making it easy for people who wish to attend both days and stay in London. The training session agenda is yet to be confirmed, but it is likely to be an informal (presentation style) session where the use of the wizards will be covered in the morning session, with the powerful APIs covered in the afternoon. The RUG will be a free of charge event, but there will be a nominal charge for the O4W training session. Please contact me if you would like to provisionally register for either or both of these two days and I will email you with further details as I have them.